On Thursday, April 19, the ASU and broader communities are invited to the events marking this year’s Yom Ha’atzmaut, Israel Independence Day, which commemorates the 1948 establishment of the modern state of Israel. Organized by the Center for Judaic, Holocaust and Peace Studies and ASU’s Hillel chapter, eminent historian Prof. Konrad H. Jarausch. Jarausch, the Lurcy Professor of European Civilization at UNC-Chapel Hill, will give an evening lecture entitled “Broken Lives: How Ordinary German Jews and Gentiles Experienced the Twentieth Century.” It will begin at 7:30 pm in Belk Library and Information Commons, Room 114, on the ASU campus. Throughout the day, there will also be a Hillel-organized contact table on Israel at 70 in Plemmons Student Union. Jarausch’s talk serves as the keynote that marks this year’s Yom Ha’atzmaut. It looks back at the mid-twentieth century, while a panel discussion on the eve of Yom Ha’atzmaut takes a closer look at Israel today. This April 18 panel starts at 7:00 pm in Plemmons Student Union, Summit Trail Solarium, Room 118, 1st floor. 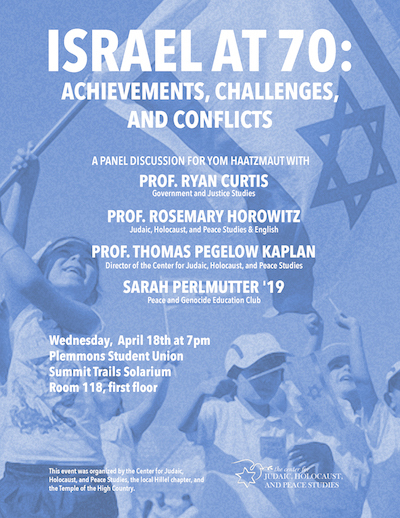 Panelists include Dr. Rosemary Horowitz (English/JHP), Dr. Ryan Curtis (GJS), Sarah Permlmutter '19 (Peace and Genocide Education Club), and Thomas Pegelow Kaplan (JHP/HIS), the Director of the Center for Judaic, Holocaust, and Peace Studies. Professor Jarausch, the keynote speaker on Thursday, has written or edited some forty books in modern German and European history. Starting with Hitler’s seizure of power and the First World War, his research interests have moved to the social history of German students and professions German unification in 1989/90, with historiography under the Communist GDR, the nature of the East German dictatorship, as well as the debate about historians and the Third Reich and the Holocaust. More recently, he has been concerned with the problem of interpreting twentieth-century German history in general and the learning processes after 1945. 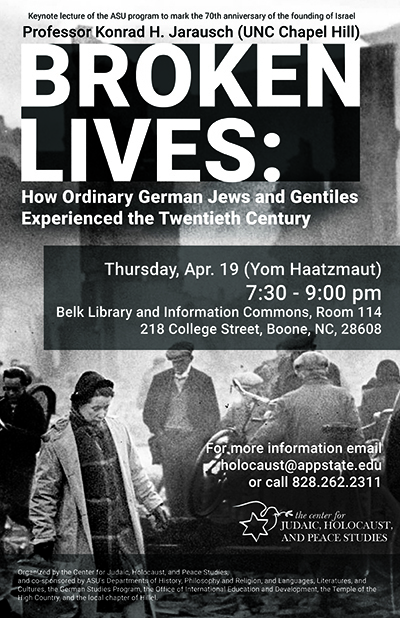 For more information, contact the Center for Judaic, Holocaust and Peace Studies at holocaust@appstate.edu or call 828.262.2311. Organized by the Center and Hillel, the lecture is co-sponsored by ASU's Departments of History, Philosophy and Religion, and Languages, Literatures, and Cultures, the German Studies Program, the Office of International Education and Development, and the Temple of the High Country.